Pope Francis is expected to take a provocative stance on global climate change Thursday, releasing an encyclical — a teaching letter addressed to Catholic bishops — that not only affirms the reality of man-made warming but issues a moral call for changes in lifestyle, consumption and policy to stave off environmental disaster. The pope appears to have chosen the name “Francis” – after Saint Francis of Assisi – for good reason: Saint Francis of Assisi is not only known as the patron saint of animals and the environment; he also changed his own lifestyle from a life of wealth and over consumption to a life of bare subsistence in service of the poor. His father was Pietro di Bernardone, a prosperous silk merchant. Francis lived the high-spirited life typical of a wealthy young man, even fighting as a soldier for Assisi. While going off to war in 1204, Francis had a vision that directed him back to Assisi, where he lost his taste for his worldly life. On a pilgrimage to Rome, he joined the poor in begging at St. Peter’s Basilica. The experience moved him to live in poverty.Francis returned home, began preaching on the streets, and soon gathered followers. Francis preached the teaching of the Catholic Church, that the world was created good and beautiful by God but suffers a need for redemption because of the primordial sin of man. He preached to man and beast the universal ability and duty of all creatures to praise God (a common theme in the Psalms) and the duty of men to protect and enjoy nature as both the stewards of God’s creation and as creatures ourselves. On November 29, 1979, Pope John Paul II declared St. Francis the Patron Saint of Ecology. 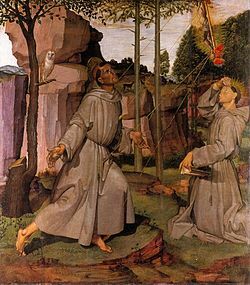 Many of the stories that surround the life of St. Francis say that he had a great love for animals and the environment. Perhaps the most famous incident that illustrates the Saint’s humility towards nature is recounted in the “Fioretti” (“Little Flowers”), a collection of legends and folklore that sprang up after the Saint’s death. It is said that, one day, while Francis was travelling with some companions, they happened upon a place in the road where birds filled the trees on either side. Francis told his companions to “wait for me while I go to preach to my sisters the birds.” The birds surrounded him, intrigued by the power of his voice, and not one of them flew away. He is often portrayed with a bird, typically in his hand. Another legend from the Fioretti tells that in the city of Gubbio, where Francis lived for some time, was a wolf “terrifying and ferocious, who devoured men as well as animals.” Francis had compassion upon the townsfolk, and so he went up into the hills to find the wolf. Soon, fear of the animal had caused all his companions to flee, though the saint pressed on. When he found the wolf, he made the sign of the cross and commanded the wolf to come to him and hurt no one. Miraculously the wolf closed his jaws and lay down at the feet of St. Francis. “Brother Wolf, you do much harm in these parts and you have done great evil,” said Francis. “All these people accuse you and curse you…But brother wolf, I would like to make peace between you and the people.” Then Francis led the wolf into the town, and surrounded by startled citizens made a pact between them and the wolf. Because the wolf had “done evil out of hunger, the townsfolk were to feed the wolf regularly. In return, the wolf would no longer prey upon them or their flocks. In this manner Gubbio was freed from the menace of the predator. Francis even made a pact on behalf of the town dogs, that they would not bother the wolf again. Finally, to show the townspeople that they would not be harmed, Francis blessed the wolf.